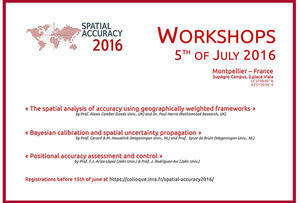 the International symposium on "Spatial Accuracy Assessment in Natural Resources and Environmental Sciences" which will be held, forits 12th edition, in the southern French city of Montpellier, from the 5th to the 8th of July 2016. This 12th International Symposium is the latest in an academic conference series helding every two years since 1994 under the auspices of the International Spatial Accuracy Research Association (ISARA). 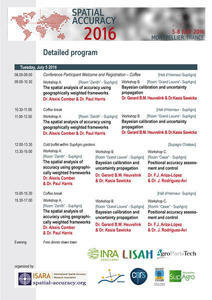 The Symposium is a unique place to bring together experts from environmental sciences, natural resources, spatial statistics, and geographic information science developing theory and methods for assessing and understanding spatial accuracies and spatial uncertainties in mapping, monitoring systems and spatial simulation platforms. This 12th edition of the symposia will focus on sensitivity analyses technics for spatial modelling (ranking the importance of spatial input uncertainties) as well as the management of spatial uncertainty in Knowledge-Based Systems. The symposium program includes an assortment of keynote speakers, invited paper sessions, contributed paper sessions, posters, student paper competition, social events, visits and workshops at the begining of the symposium.